What an honor to write you a post for Father's Day. I happen to know we have some dads in our trading group whom I truly respect for the most important job in life they do- and I don't mean trading. This will also be a short story about my own dad, and some of his quips. Hopefully you'll all see what you mean to your kids on your special day through my eyes. I have so many bits of wisdom from my dad meshed in my brain that see me through my life. He used to say to us, "Don't just go out on a limb.. jump up and down on it when you get out there! The branch will break, but the limb will flex and propel you up." You have no idea how many times this comes to me during the trading day, and especially through this bear market rally. There have been so many times I have just wanted to quit, but I remember his words all over again. BTW- he went long the RUT at the March bottom and just cashed in recently. He beat my returns last year hands down without even blinking. There was a Fourth of July when we were kids, and he was driving us in one of his various land yachts to see a parade. Somehow he made a wrong turn and we were now in the procession of the parade between a high school marching band and a group of Fez wearing Shriners in those little clown cars. That was the day he taught me that adapting to whatever life throws at you can be a good thing. It's all how you frame it - it's all in your attitude. He had a big cowboy hat in the back seat ( he was a beef broker, don't ask!) ... and asked my brother to hand it to him. He rolled down all of the windows of the car and laughed, "Wave at the crowd, kids. They think I'm the Grand Marshal." He was like that- never just the observer while life passed by - he was the parade and the grand marshal all at once, regardless of the circumstances. The crowd waved back at us and cheered. Rise to the occasion and laugh at the ironic. "There are no dress rehearsals in life, he'd tell us through our lives. You get one shot at this, make it count and make it good." I could tell a thousand stories like that about him, and each one of them is my proof that it's in the living we teach and impart what's important in life, and the skills our kids need to become the best they were meant to be. Giving up was never an option in his opinion, and "follow your bliss," was his best advice of all. Working hard and working smart is the difference between you and the next person, he'd urge us. "When success comes knocking at your door, above all else… remain humble." He lived his own wisdom and had great success in life mingled with smaller failures that he turned into stepping stones. His life is one of those "starting with nothing but a dream and going well beyond his wildest imagination" stories. But if you were to ask him what his greatest success and happiness has been, he'll tell you it's his children and grandchildren, and he never lets us forget it. I happen to know there are many dads here on this blog just like him every single day, and you are the quiet heroes as far as I'm concerned. I have such deep respect, affection and admiration for all of you. Your job is not easy. Nothing important is ever easy. Keep on keeping on. He is in his golden years now, one in the dwindling group known as The Greatest Generation, and can't jump on those limbs with a set of bad knees from old age. But to this day he is still wheeling and dealing.. often calling to ask me what I'm trading and how the market is doing. Now he seeks my wisdom and advice... and as a daughter, you can't imagine what that means to me. And yes, it was me who suggested he get long back in March and I never told him to bail until late April. If I had only listened to my own advice and not bailed too early on my own March longs... But I'm rising to the occasion, jumping up and down on the limb for all it's worth and laughing at the ironic. 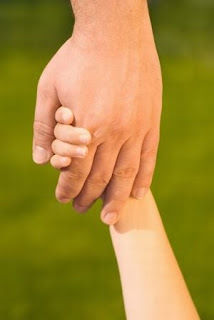 TTW Dads: Know that your children will carry your wisdom and love with them way beyond what you imagine. You are giving them a gift of value beyond measure, even when you think nothing sinks in. Know that someday one of them might be writing something just like this in your honor because you made the hard choices in life, waved to the crowd and yes.. even listened to them and took their advice. Know that they'll honor you because you loved them unconditionally and without limit. Love them when it's not easy to love them, when you think you're on the verge of quitting - the ROI is better than any trade you'll ever make on your very best day. Love yourself for being the dad you were meant to be. For my Papa- Thanks for everything, I couldn't have custom ordered a better dad if they gave me the option. And a big, heartfelt Happy Father's Day to all of our TTW Dads! You are incredibly special men - I really mean it. Enjoy the day meant just to honor and thank you! For all the dads who aren't with us anymore and we miss.. we will never ever forget you. I'm reading: Father’s Day Weekend on TTW $$Tweet this!